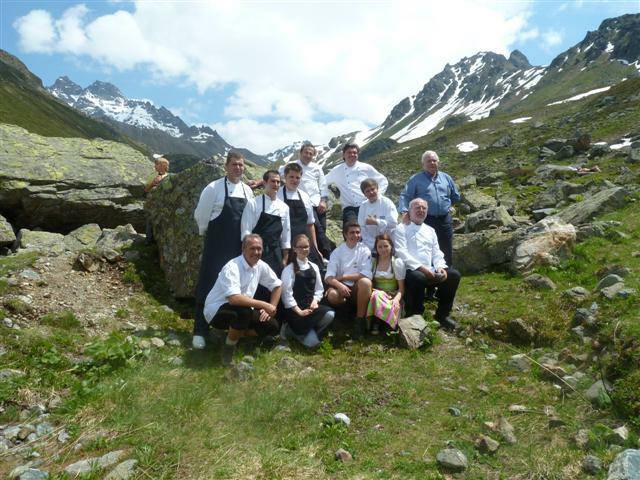 Home » Countries » Cuisine » Featured Articles » Ischgl, Austria, in the Tyrol Mountains. Stylish for Skiers, Silent in Summer! Ischgl, Austria, in the Tyrol Mountains. Stylish for Skiers, Silent in Summer! Austria is bordered by eight Countries. Originally a farming community, it was declining fast as the younger generation moved away in search of employment. But now that it’s been transformed into a luxury ski resort, the youngsters can easily find work locally. I visited it in the late Summer, when it’s quiet and nearly deserted everywhere. We stayed in the 4* Hotel Yscla, which I loved. Everything has been designed and locally made specially for the hotel, so Craftworker me was in my element, examining curtains, mats, pictures and ornaments. Most of the hotels in the area have hand-carved patterns on the outside, all done by local Craftsman Paul Zangerl and his two sons. In the morning we drove a few miles along the road to Kappl and caught the cable car up to the next level, where there are lots of family activities, and wonderful views. Before we got into the cable car we were each given a bottle of locally-made lemonade, and a sandwich. The weather was hot, even though we were nearly 2,000 ft above sea level! Then we huffed and puffed further up the mountain, passing lots of aromatic herbs, with details of their names and uses. We gratefully reached the Alpe Dias Cheesemaker’s hut, where food and drink had been laid on for us, including local beer. After watching a Cheesemaking demonstration we were invited to sample some traditional dishes. There was potato mixed with their own cheese, and lots of their butter. Corn is cooked until brown, then water and cheese is added. 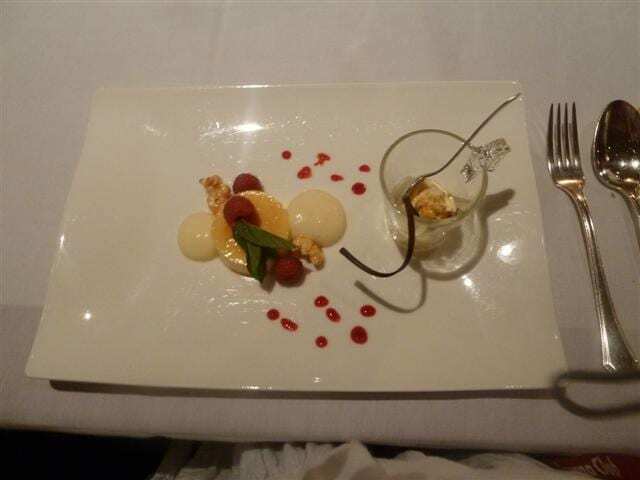 This dish used to be eaten six days a week as they were too poor to afford anything else except on special occasions. The third dish was sauerkraut with fatty bacon and sausage. 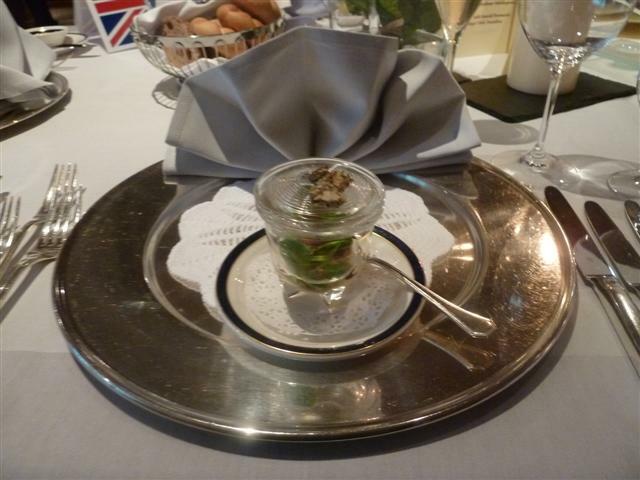 I was put off trying the food as some enthusiastic people were double dipping! But I managed to sample it in the kitchen where they were preparing some fresh supplies. In the evening we were invited to the 5* Trofana Royal for a dinner, and to meet Chef Martin Sieberer, who has three Hats; the Austrian equivalent of Michelin Stars. He has started a project with Chefs from Italy, Belgium, Holland and Germany. 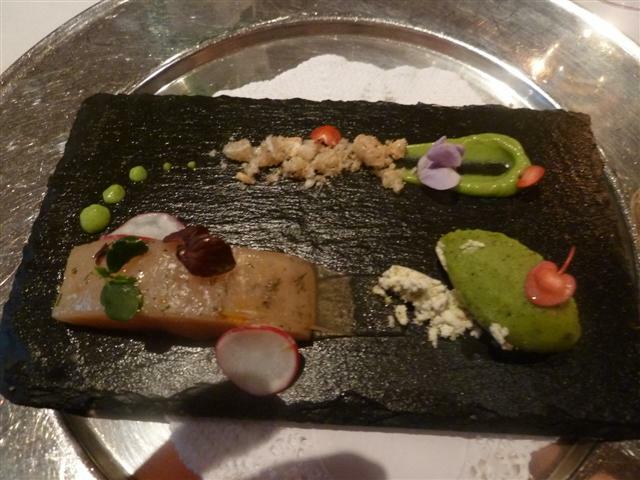 They each take Austrian dishes and put their own touch to them. 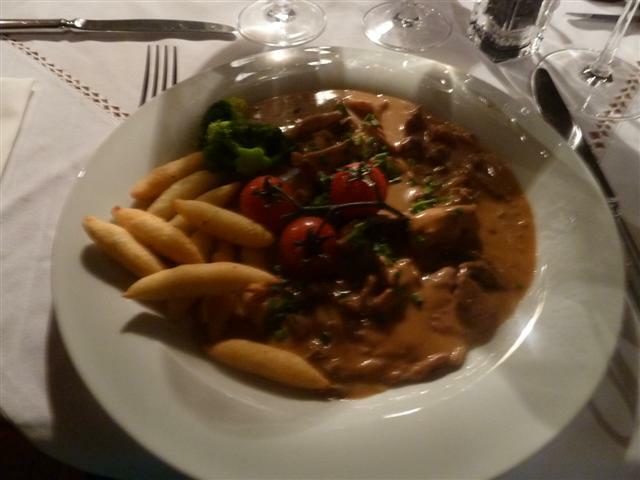 Their dishes are available at different Huttes in the Summer months, for hikers to sample. The food was outstanding. I had two glasses of Champagne, a glass of white wine and lots of water. I passed on the Schnapps. That’s all, I swear it! But when we got outside, I realised I could hardly stand! My legs felt like jelly. Sue was in fits of laughter as she held me up while I staggered from side to side, trying to keep my balance. It was really weird! Then she confessed that it happens to a lot of people due to the altitude. In fact, two of the men, young and fit, and seasoned drinkers, who had sampled the Schnapps, didn’t appear until the following evening! They’d slept all day. They were gutted as they were keen sportsmen, and they missed the day’s bike-riding. In the morning – without a hangover, thank you very much! – We drove to Scheibenalm, in Galtur. Some people were hiking up the mountain to Jamtalhutte, and some were biking. Sue and I were having a lift up and walking back. I’m a fit non-smoker and I can walk for miles. But I don’t get on with altitude. It hurts my chest and leaves me breathless. But I’m always OK coming down! It was beautiful waiting in the sunshine, admiring the view and watching the cows dine on a selection of mountain flowers and herbs growing in the lush green grass. Our lift arrived and as I bent down to pick up my rucksack, I got a shock in my chin from the electric fence. I looked ten years younger for a week! At the Hutte, we were the first to arrive. We took each other’s photos, standing on a glacier. It’s taken millions of years to reach the mountain top, and it was melting in the hot sun. Then we listened out for the whistling call of the marmots, which are like meercats. But we didn’t hear any. Everyone began to arrive, including young children on e-bikes. A lot of the children wore National Costume, and they scampered up and down the mountain rocks like young goats. Nobody called out ‘Be careful,’ or ‘Come down off there at once!’ and none of the children had any accidents. It was so hot that we sat in the shade while Martin Sieberer, wearing his traditional leather shorts, and the other chefs prepared the food. Then we all queued at the Chef of our choice and sampled all the dishes. While we ate, a group in National Costume went from table to table, playing and singing Sommer in Der Baum, (Summer in the Mountain,) over and over again. I won’t be buying the CD. Everyone began to disperse. Sue and I walked down the mountain. It was unforgettable, with lots of fast-flowing rivers, snow-capped mountains, and multi-coloured heather and flowers all around us. Every now and then there was a hissing sound and a couple of cyclists would pass us with a friendly wave or a comment. An ambulance and a police car whizzed past us up the mountain. Before we got to the first level we were told what had happened. A German lady cyclist had hit a rock or something and flown over the top of her handlebars. All very efficiently dealt with. In the evening we travelled a few miles away to Walserstube for a really delicious dinner of local dishes, all far too large to finish! The next morning I awoke and went to look out of the window, half-expecting to see teams of men collapsing the hotels opposite and erecting a Wild West salon, jail, etc. Well, it all has a surreal feel about it, like a film set. Everyone else was going cycling, motor-bike riding, etc. but I wanted to explore the towns and discover the history and places to visit. And Sue was eager to show me around. We both had a Silvrettacard (see the notes at the end) so we caught one of the frequent buses to the Museum Alpinarium in Galtur. This is built on the site of a terrible avalanche in 1999. The weather was bad, so most people were indoors at the time. The tumbling snow rushed down the mountainside at an amazing speed, and killed 31 people in their houses and a hotel. We asked the lady behind the desk if she had any literature in English. ‘No ve haven’t!’ she snapped, then, ‘Ve have one inside. You can go through here vithout paying!’ Then she threw the gate open for us. She was actually nice and helpful. We did laugh! We sat on the terrace and drank a coffee while Sue pointed out dark lines in the snow. Patrols are out all winter, checking the build-up of snow. If it’s dangerous they dynamite it. Tunnels in the mountains are used for shelter if necessary. We caught the bus back to Ischgl. The shops were closed and the streets were empty. There’s a good selection of hotels, bars, clubs and shops. The town is immaculate. I didn’t even spot a cigarette end on the ground. 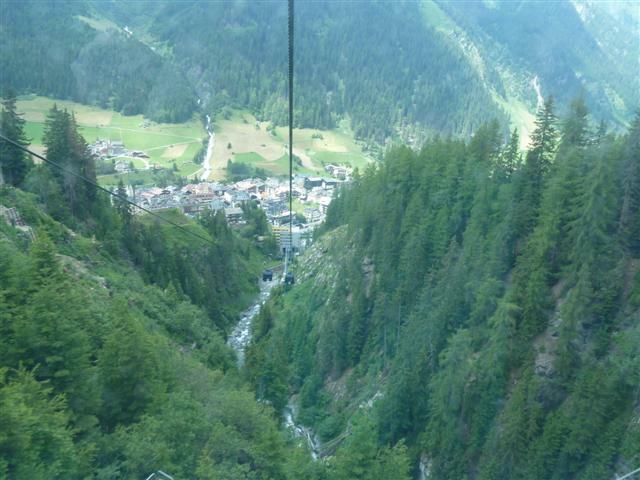 A cable car travels right over the town. It’s not a pretty sight, but it’s a very important part of Ischgl’s economy. Although we had flip-flops on and no sweaters with us, we decided to risk travelling up the mountain as it was a lovely day, so we caught the cable car. On the way we passed several ponds. They have a snow guarantee. If it doesn’t snow, they make it! But they’re not allowed to use the water supply, so they have man-made reservoirs and snow-making machines. In November, 2011 there was no snow, so they made 80kms of runs, costing a million euros. But they got their money back, plus a huge profit! At the top of the mountain, in Idalpe, we sat in the warm sun outside the Alpenhaus Bergrestaurant, beside a tub of edelweiss. We ordered Cheese soup with bread, and it took a long time to appear. It was only just hot enough to eat, and I could have done with it a bit hotter. 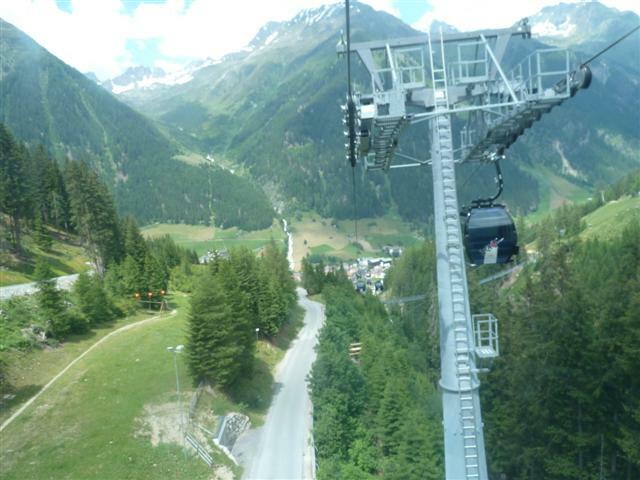 But Sue told me that as we were at 2,300mts, 900mts higher than Ischgl, the air pressure is lower and there’s less oxygen. So it takes a lot longer to boil water. Apparently at the top of Everest it takes about half a day to boil a kettle! Anyway, the soup and the bread were delicious. All the supplies have to be transported up the mountain in the cable cars. Back in Ischgl’s town square, Sue told me that they always have a big star performing at the start of the ski season. Lionel Richie was asked to perform in Austria by his agent. Sure, he said, Where? Vienna? Salzburg? No, in a small town called Ischgl. OK he replied, How many people will be in the theatre? It’s not a theatre. It’s outside. Is it warm in Austria then? No, you’ll be on a stage in the snow. OK, I wouldn’t miss it for the world! said Lionel. And he didn’t! But you can keep the cold and snow as far as I’m concerned. 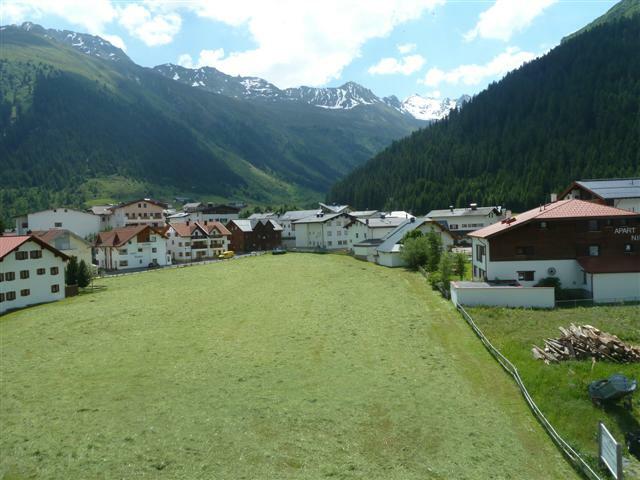 Summer in Ischgl is a wonderful experience. The weather’s warm, the food’s fantastic, the scenery’s stunning, the crime rate’s almost zero, and the people are friendly and welcoming. It’s a high-quality resort. I just don’t understand why it’s still an undiscovered gem! Czech Republic, Germany, Hungary, Slovakia, Slovenia, Italy, Switzerland, and Lichtenstein. Or … fly into Innsbruck (easyJet via Gatwick, Bristol or Liverpool), Zurich (BA; Swiss) or Munich (Lufthansa) and hire a car or use the bus/train for onward travel to Ischgl (the nearest railway station is at Landeck, which is 40 minutes away by road). Book accommodation direct through the Paznaun-Ischgl Tourist Office via paznaun-ischgl.com; incoming@paznaun-ischgl.com or 0043 5099 0700. 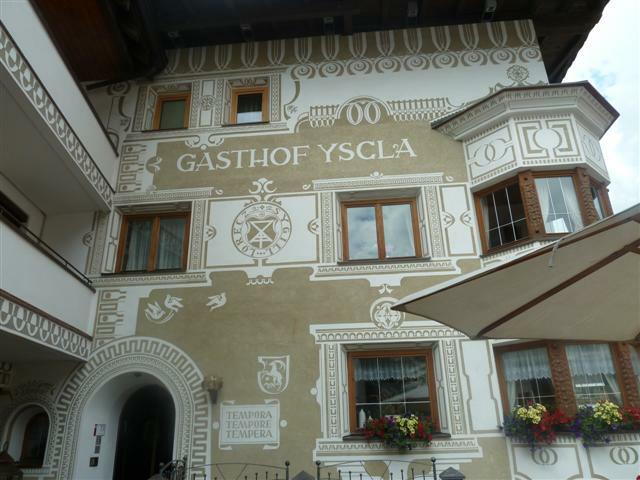 We stayed at the 4* Hotel Yscla in Ischgl yscla.at 0043 5444 5275 where prices are from €75 per person per night half board. Holidaymakers staying in Paznaun are given the Silvrettacard, a guest card which gives entry to many activities, attractions, local buses and cablecars, plus discounts on equipment hire such as mountain bikes and motorbike hire at the High-Bike TestCenter. 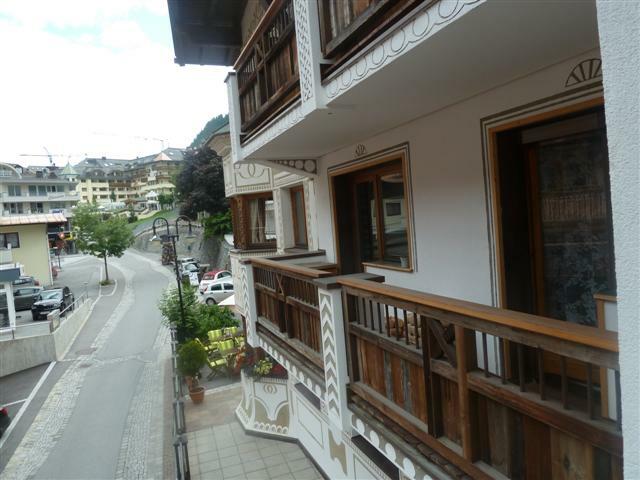 An advanced accommodation booking will allow free bus transfer to the valley from Landeck. 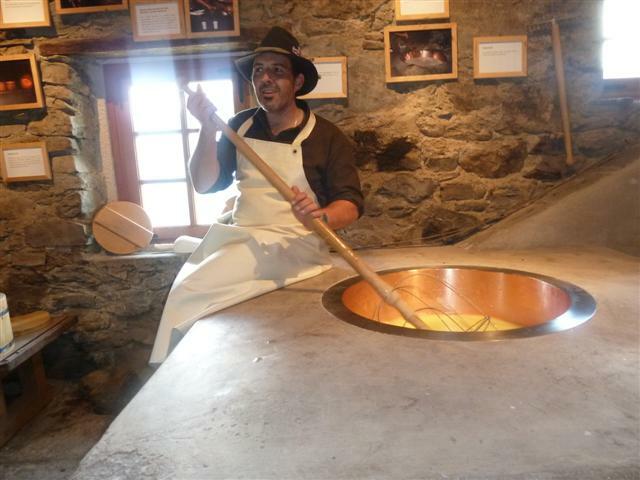 The Alpe Dias cheese-making hut that we visited in Kappl is a NEW attraction. Ski-write has press releases on most summer activities, so please ask if you’d like to be sent any . Summer flowers on the mountain and in the meadows include alpine rose, gentian, edelweiss, anemone, cranesbill and forget-me-knot. Ischgl has a wide choice of restaurants, from rustic inns to five star gourmet dining, as well as a good choice of bars, discos and nightclubs. 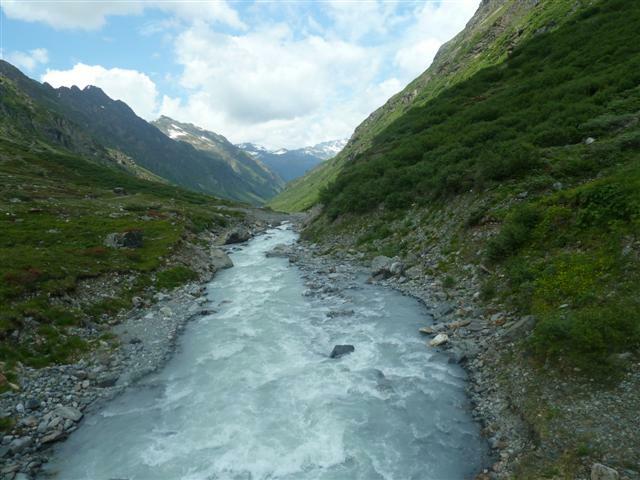 For further details on Ischgl, Galtür, Kappl and See, visitors should have a look at www.paznaun-ischgl.com or call the Paznaun-Ischgl Tourist Office on 0043 5099 0100.